3. Enjoy Gotjawal in the Garden of Animals and Plants for a train trip! 4. 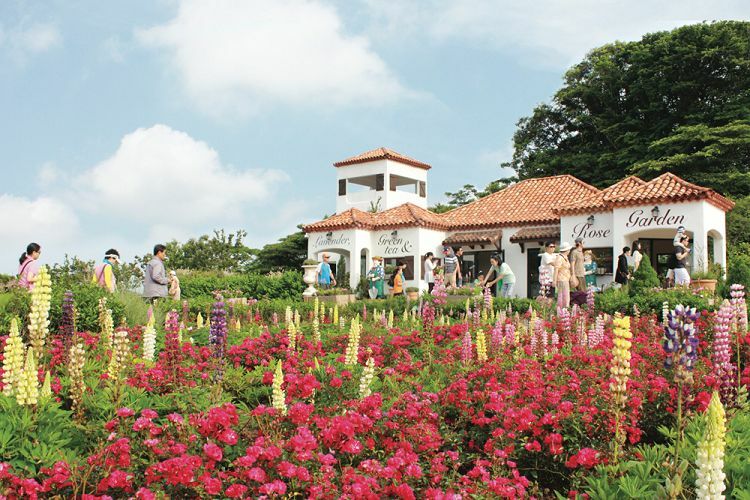 Enjoy the fun trip to Jeju Island with the five senses through exciting experience and delicious food! 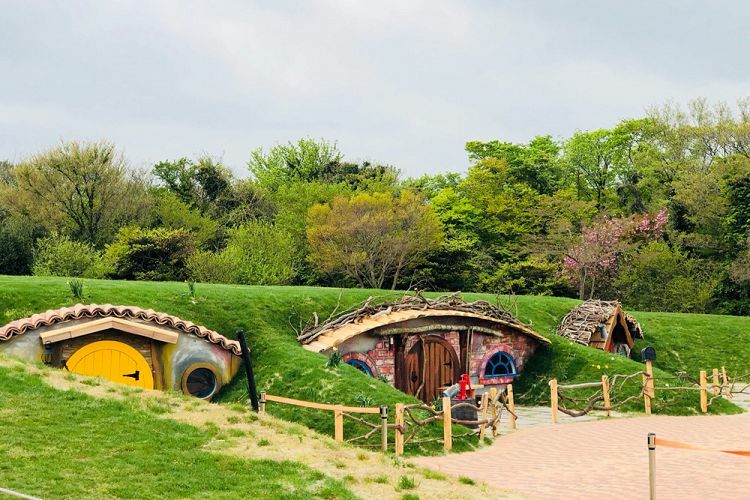 Eco Land Theme Park gives a chance to experience the approximately 1-million-square-meter large primitive forest of Gotjawal on Lincoln Locomotive handmade in England based on Baldwin which is the steam locomotive from the 1800s. "Gotjawal" is a dialect of Jeju Island. It refers to the type of forest unique to Jeju Island which was formed on the bumpy geographical features created by highly viscous lava erupted from the volcano broken down to small and large rocks. 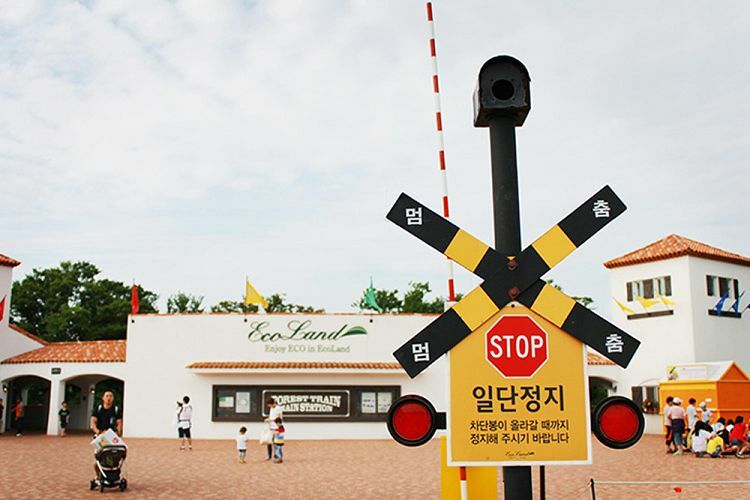 • Main Street: The donut-shaped main station of Eco Land is the starting point and the ending point of Eco Land Train Tour, and it is composed of various facilities such as the ticket office, waiting room, snack bar, restaurant, souvenir shop, central fountain plaza. • Eco Bridge Station: Eco Bridge Station has a 300m long deck over water along the 66,000 square meters large lake and it gives the feeling of walking on the lake. • Lake Side Station: Lake Side Station was the grassland for the breeding horse. 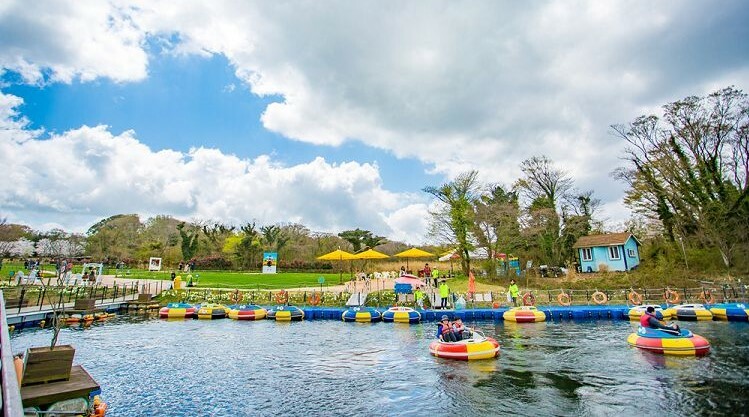 Visitors can enjoy the view of the lake that maintains the original geographical features of the land alongside the exotic scenery of the windmill and Discovery Zone. • Picnic Garden Station: This is the place where you can enjoy a picnic on the grass that spreads vastly. This station includes 'Kids' Town' for children to play and the Eco Road, the Gotjawal forest trail only available in Eco Land. Those who wish to take Forest with Commentary and Gotjawal Healing Program should find the Forest Commentator at Picnic Garden Station! • Lavender, Green Tea & Rose Garden Station: Get off the train and cross the Garden Bridge to find European Garden with herbs, roses, and green teas and the lavender field and vast grassland beyond the secret fence! • The interval between train operations is 7~12 minutes. 1. Purchase the product and Check mobile voucher or email voucher. 1. Please be sure to exchange voucher into actual ticket 10 minutes before the departure! 2. Please carry the ticket with you until the end for the ticket inspector might ask for it. 3. Last train hour can be changed according to sunset hour. 4. Tickets are sold until 10 minutes before the departure of the last train. 5. Those who want to take the long course for Eco road must get on the train at the main station. Q. Where can I store the belongings? A. You can find the locker next to the snack bar in Main Station. A. You can rent out a wheelchair if you go to the ticket counter with your passport. Q. What is the required time for looking around? A. Required time to enjoy the park varies depending on the way visitors view. • First, it takes about 30 ~ 40 minutes for customers without getting off at the stations. In this case, re-boarding is not possible, so please be careful. • Second, it takes about 1 hour for customers who get off at 1 ~ 2 stations. • Third, it takes about 2 ~ 3 hours to get off at all the stations and experience all the themes. • Additional charges for transferring trains from departure to arrival are not applicable.